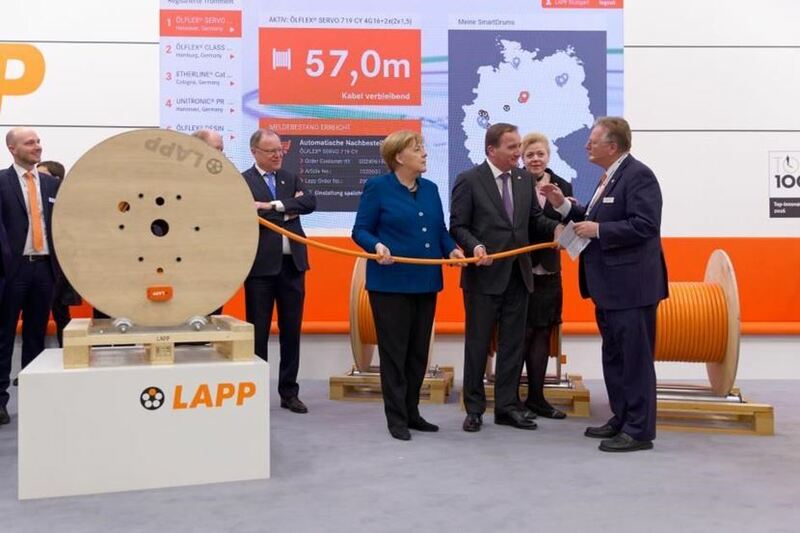 Andreas Lapp, CEO of Stuttgart-based LAPP Holding AG, took the opportunity to briefly introduce his company to the guests: "We are a hidden champion and world market leader in the field of cable and connection technology. LAPP has 18 production sites worldwide, 44 international sales companies and 4,245 employees. "LAPP is also very successful in Scandinavia. In Sweden we employ more than 100 people". Digitalization and Industry 4.0, summarized at LAPP under the term "Industrial Data Communication", are very important topics for his company, according to the CEO. As an example of how digitization automates and accelerates processes, he demonstrated a prototype of the Smart Cable Drum, which LAPP is developing together with Schildknecht. "With the help of a sensor and electronics with radio transmission, the current cable inventory is determined and transmitted to a data portal in a cloud. This opens up a wide range of applications, for example, it can significantly simplify warehousing: Once a predefined minimum stock level has been reached on the cable reel, the system automatically triggers a repeat order. Another possible function is theft protection: The cable drum can also be equipped with a GPS module - if a movement is registered at a time when no work is being done, this could automatically trigger a theft alarm. New business models are also conceivable: LAPP could make the cable drums available to its customers as commission goods in the form of pay-per-use and bill consumption according to the values determined using Smart Cable Drum technology, while at the same time ensuring timely subsequent delivery. "In this way, we offer our customers real added value through digitalization," emphasizes Andreas Lapp. At Hannover Messe, the company wants to talk to potential customers and sound out possible concrete fields of application.